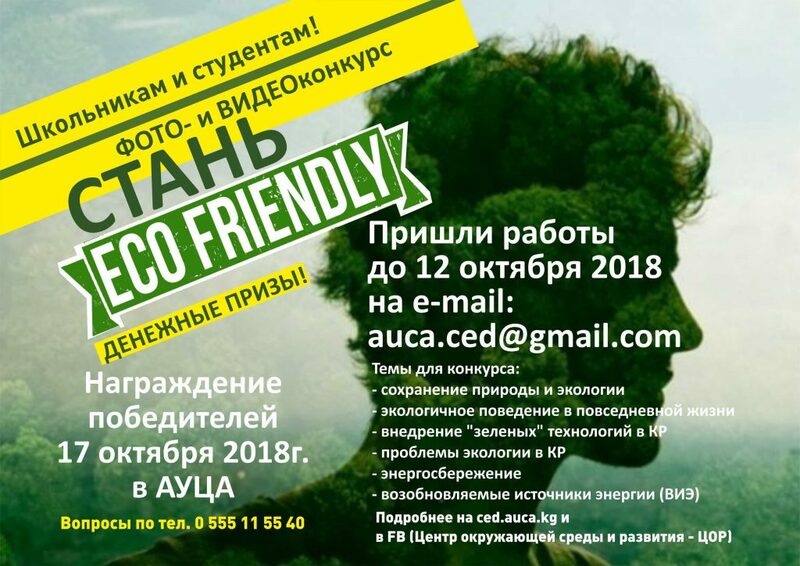 AUCA Center for Environment and Development (CED) invites all students to participate in green economy photo and video contest. Your work can be devoted to the problems of ecology, energy saving and efficiency, renewable energy, natural resources, and green technologies in production and everyday life. The contest is taking place from September 17 to October 12. All students are eligible to participate. 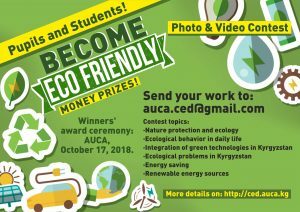 Please, send you photo and video entries to auca.ced@gmail.com by 5 pm on Friday, October 12. No late entries will be accepted. The best shots will be presented to a large audience during the National Green Economy Week – 2018. The National Green Economy Week is initiated by the Ministry of Economy of the KR and will be held in Bishkek in October 15-20. – Photos and videos must be taken within the green economy topic and not been presented before to the wide audience. – A maximum of one entry will be accepted for each participant/team of participants. – Photographs must be sent in JPG format: minimum 2398х3602 pixels. – Video must be not longer than 5 minutes and be in MPEG4, AVI and WMV format in high resolution (1920х1080). – The subject of email should include the following: Contest, genre, full name of contestant. e.g. Contest. Photo. Smith J. – The letter should include contacts: full name, phone number (preferably mobile), email address. – All entries must have been shot by the contest participant. The entries will be judged by a board members (CED and other green economy experts) depending on the subject matter, originality, creativity, and idea. Three winners from each genre (photo and video) – first, second, and thrid place – will receive monetary prizes and certificates from the Center for Environment and Development. Winners will be notified by e-mail, and will be announced on CED web-page ced.auca.kg. Award ceremony will take place on October 17, during the Education and science in green economy seminar in AUCA. If you have any questions, please contact Margarita: lazutkina_m@auca.kg , 0 555 11 55 40.